In the decade before the Civil War, Martin R. Delany was active in the movement to relocate free blacks to Liberia, where they might have greater freedoms. Yet with the outbreak of the Civil War, Delany — and many other African Americans — recognized the war as a potential stepping stone to equality. The African American community saw great possibilities for greater freedoms through active military service. In particular, black men who served in the Union army claimed that their manhood — as proven through participation in the war effort — justified their rights to citizenship. This portrait emphasizes these qualities of manhood, military service, and leadership. 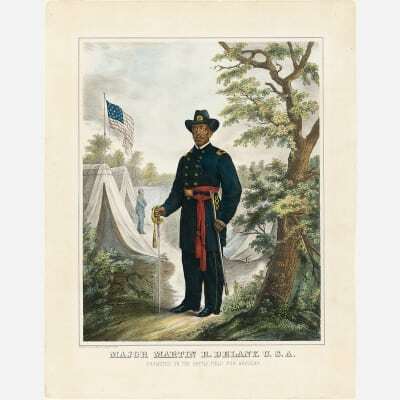 Delany appears in his major regalia (Delany was the only black officer to receive the rank of major during the war) as a stern, dignified, and prepared leader, alluding to the importance that all African American soldiers played in the Union effort.